Like so many fells Great How has two very different sides. To the west, overlooking Burnmoor Tarn and the upper reaches of Whillan Beck there is a line of crags, with Raven Crag towards the centre. These crags start at Oliver Gill in the north, and run south and then east, ending at Whinscales, north of Stony Tarn. To the east the fell drops gently into Quagrigg Moss, a peat bog with a scattering of small tarns. This isn't one of the wetter bogs in the area, although it does need some care to cross without getting wet! The summit of Great How sits a bit too far back from the western edge of the fell to have the best views in that direction - instead head towards the top of the crags to get the best view of the valley around Burnmoor Tarn. The summit does offer a good view back up Scafell, and across Eskdale (with limited views of the valley bottom itself). The crags block most routes up from the west, but it is possible to make your way up alongside Oliver Gill. A path runs north from near Lambford Bridge to the gill, running below the crags. Follow the line of the gill until you are above the crags, then turn right again and head south towards the summit. It is also possible to reach the gill from Bulatt Bridge, although this involves crossing some wet ground. From the south follow the lovely path that runs along a lovely terrace from Wha House in Esk Dale towards Scafell. After crossing Cat Cove this path begins to climb up towards Slight Side, and Qquadrigg Moss comes into sight. Leave the path and head across the moss (pick your own path), to reach the summit area from the east. Our ascent of Scafell from Wasdale visits Great How on the way back down the fell. The summit is at the top of a fairly gently rise, set about half way between the western crags and the moss. Oliver Gill forms the northern boundary of the fell, running west to flow into Hardrigg Gill. This then flows south to join Whillan Beck just east of Burnmoor Tarn. Whillan Beck forms the western boundary of the fell. There is no clear southern boundary, but instead a number of becks that flow south away from the fell - Brockshaw Beck running south-west, Catcove Beck to the south-east and some of the sources of Cowcove Beck running out of Quagrigg Moss. 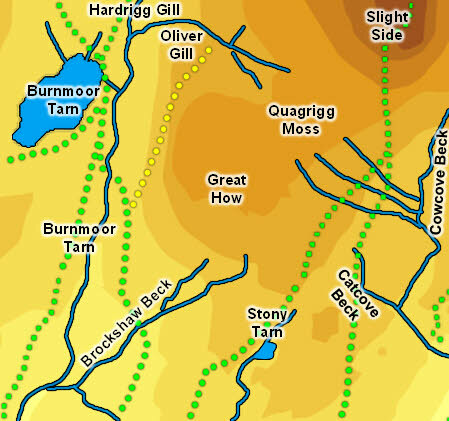 Great How is covered in tiny tarns, with the main clusters north-west and south of the summit and in Quagrigg Moss.